It would be super duper lovely to be able to scope out plans for the week, Sunday through Saturday with the days of the week as the headings. Thank you! I have an andriod and I would really love to be able to change my caledar view. Maybe toggle between tasks or be able to swipe down to see full calendar view instead of the ¹/2 cal. ¹/2 task last on the widget. Even when I open the full ap, I cannot view a whole week or whole month and easily view all tasks. I find myself opening my google ap to do this, verify event was added to the correct day bc sometime it adds to the following month, same day and to set custom reminders like, add an event every 3rd Friday of the month. Any.do has been so big for me and my success. However, I think the calendar tab and feature needs a lift. It's so hard to read the calendar and see what events are happening on that day. Please make this calendar include the events on the physical calendar as opposed to below it. Add the ability to choose the calendar view, day, week, month. I just started using the Any.do Cal app that they abandoned, and I would like a view like that. It's one day at a time with the focus on that day only, with swipes to the left or right switching between days.. I much prefer that, it keeps me focused on planning for that day, and not getting distracted. I tried the new any.do app, but it shows everyday in a list, I would much rather the option to just show one day at a time, and then be able to switch to other days as I need... Please add this as an option. which helps to see the big picture, long-term operation and campaigns, and cross months projects. 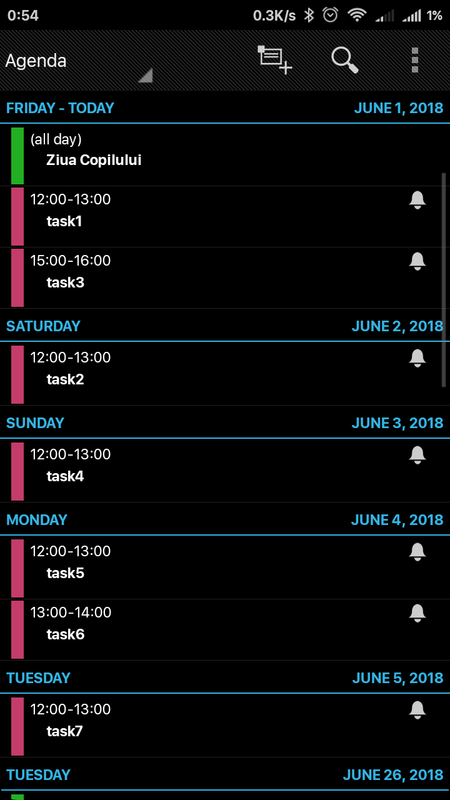 There is a way to see all tasks in a whole week, like an agenda? Display the calendar view weekly. Sunday to Monday and rotate between weeks. Not the day you are looking at all the way to he left. Not productive when trying to layout the week's schedule. Tried attaching picture, but it won't let me choose anything. I love Any.do but the calendar is in a list format, is there anyway where the calendar could show you what you are doing in blocks instead? So that you could visually see how busy your day is, rather than scrolling. Maybe in a weekly or monthly view? Yes! A month view with color coded appointments spelled out, not just little dots would be amazing. I travel for work a lot, and with any.do it’s hard for me to tell at a glance if that long string of dots is another travel week, or if I just have meetings and appointments all week. Instead of having a list of my schedule, it would be nice having a grid view of your daily schedule, similar to how it is on google calendar or outlook. This way, I can see my day and how much a task will take at a glance. This way, we don't need to switch before any.do and another calendar. The any.do moment is great for drag and dropping tasks to a certain time of day. Can we please access this view when we originally create tasks and events? You should be able to have a daily view for the calendar similar to the Todoist application. Also if this is done, then one will be able to see previous dates and see any incomplete or missed tasks. Day and date wise details will be appreciated. I agree with this suggestion. Instead of Today and Tomorrow and Someday. I would love to be able to assign tasks for the week more than a day in advance. Right now it is easy to schedule tasks each day or for Someday.. If I want to schedule something for the next month this should be added to the home page in the form of a calendar you can click on and schedule that task for May first for example and make it reoccurring if it's something that has to be done in the first if every month..